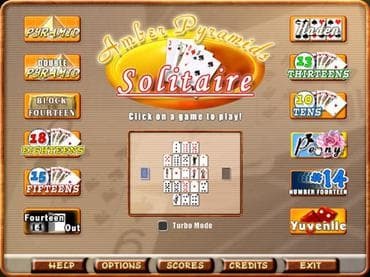 One of the most popular and addictive solitaire variations, Amber Pyramid Solitaire is perfect for a quick break or a few hours of fun. This fantastic version of the popular card game features incredible graphics, a helpful undo feature and a set of twelve of the most popular pyramid solitaire games in the world. Download free full version game and start playing the pyramid solitaire now! Free Game Features: - 12 most popular pyramid solitaire games; - Amazing graphics and relaxing soundtrack; - Game statistics; - Free full version game without any limitations. If you have questions about Pyramid Solitaire game, please contact us using this form.